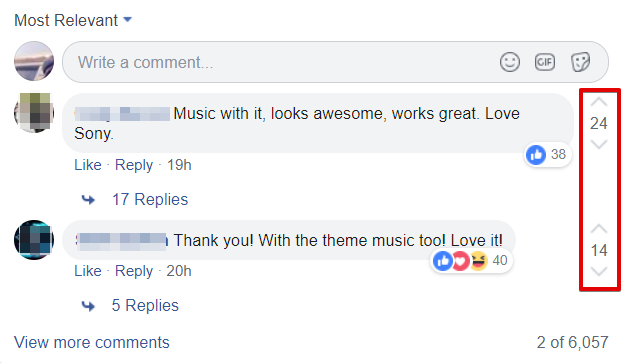 Today we noticed a new feature on Facebook that allows you to rate individual comments below posts. The whole thing works exactly like on other forums and networks like for example Reddit. Next to the comment an upward and a downward arrow are displayed, a value in between. With a click on the upward arrow, the comment is upvoted. By clicking on the downward arrow the comment is downvoted. A user can rate a comment in this way only once. This ensures that over-committed people can not distort the image. However, it is possible to change your mind, or cancel your vote, if you have mistyped. Just click on the arrow once more and the value will jump back to the original value. It seems as if Facebook is testing the new feature, because we could only find it on one page so far. It could be an alternative to the much discussed “dislike” button. Advantage here: the value of the voting represents the difference between upvotes and downvotes and is absolutely anonymous. What’s your opinion on the new feature? Have you come across it already yourself? Let us know what you think!